Born in Tikhvin in 1844, Nikolai Rimsky-Korsakov would grow up to be known as an essential composer in nineteenth century Russian culture. Remembered largely in the Western world for his signature programmatic pieces such as Russian Easter Overture and Scheherazade, the bulk of his output was his 15 operas. Rimsky-Korsakov grew up listening to his father playing popular songs on the piano by ear and by age 10, he began to compose. In 1856, he entered the Naval College in St. Petersburg following in the footsteps of his brother Voin, who was 22 years older. While in the city, Rimsky-Korsakov had the opportunity to attend operas by composers such as Donizetti, Glinka, and Meyerbeer and in his first piano studies, was introduced to Bach, Beethoven, and Schumann. By age 17, he expanded his music lessons to include theory and composition. A critical point in Rimsky-Korsakov’s career was in1861 when Mily Balakirev began tutoring him and introduced him to Mussorgsky and Cui who, along with Borodin, would later become known as the “Mighty Handful” or “The Five”. This group of composers met often to discuss their music and aimed to create a nationalistic Russian sound. They were self-trained and were in many ways opposed to academia, trying to represent a sound not rooted in classical Western music theory. Rimsky-Korsakov’s writing of his First Symphony was interrupted in 1862 when he was called to duty by the Navy. This time was not wasted, however, for the 3 years he was active, he continued composing and playing piano, buying scores and books at port, and travelling the world. After returning, he continued to explore instrumental music and found himself influenced not only by “The Five”, but also by traditional folk melodies and stories. It was in 1871 that his first opera, The Maid of Pskov was premiered and that begun a new era. Much to the dismay of his musical cohorts, Rimsky-Korsakov accepted a professorial position at the St. Petersburg Conservatory. This new atmosphere challenged him to perfect his skills as he spent more time studying music theory, while also arranging, orchestrating and conducting. In 1872, he married pianist and amateur composer Nadezhka Purgol’d with whom he would have six children. This relationship proved to be fruitful for his career as she would critique his music and produce four-hand piano arrangements for the two to play together. In 1873, the Navy established a new position for him as the Inspector of Naval Bands. In this role, Rimsky-Korsakov learned many wind instruments which only aided his ability to orchestrate so masterfully. Furthering his library of musical resources, in 1875 and 1876 he compiled two folksong collections, and in 1883 he began working at the Court Kapella exploring Russian church music for the first time. One characteristic that set Rimsky-Korsakov apart from many other composers was his perfectionism. He took great care to use all of his ideas and complete all of his works. Throughout his career, he spent a large portion of his time revising his works to meet his ever-climbing standards as he continued to grow, learn and challenge himself. At any lull for artistic inspiration in his own music, he turned to revising and orchestrating the scores of fellow composers. After feeling very satisfied with his accomplishments following The Snow Maiden in 1881, he turned to writing more instrumental works and a textbook until he experienced Wagner’s Ring. This sparked new operatic inspiration resulting in Mlada in 1888. 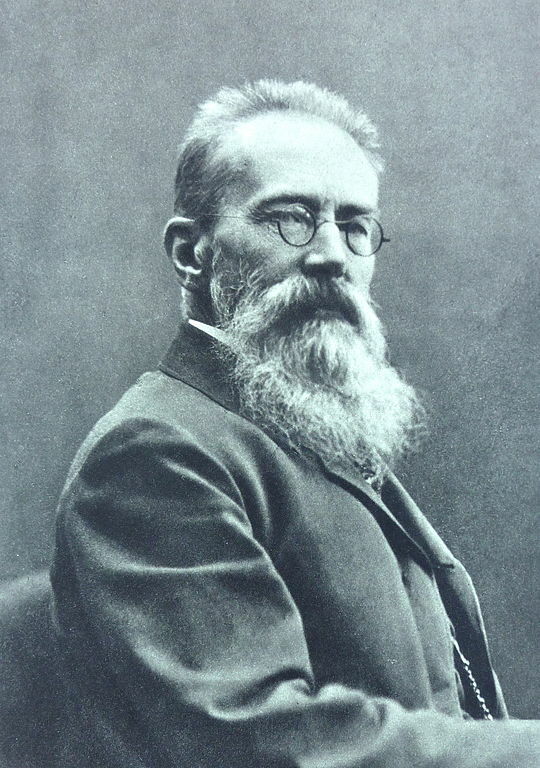 The early 1890s led to some struggle when Rimsky-Korsakov lost his mother and two children and both he and his wife found their health declining, but it did not stop him from having some of his most successful years in the final decade of his life. As a composer he never stopped experimenting and gained much success and public attention. He continued teaching, carrying on the legacy of Russian nationalistic music. Several of his students are now well known in the standard repertoire as well, including Liadow and Glazunov. Upholding his standards until his death in 1908, he left nothing unused or unfinished and lived to see the productions of all but his last opera, The Golden Cockerel, which premiered the following year. Though he is now buried in the same cemetery as Glinka, Mussorgsky, Borodin, Stasov, and Tschaikovsky, the characteristic and identifiable sound of Nikolai Rimsky-Korsakov lives on through his music. He will forever be known for typifying the Russian nationalist sound of the nineteenth century.